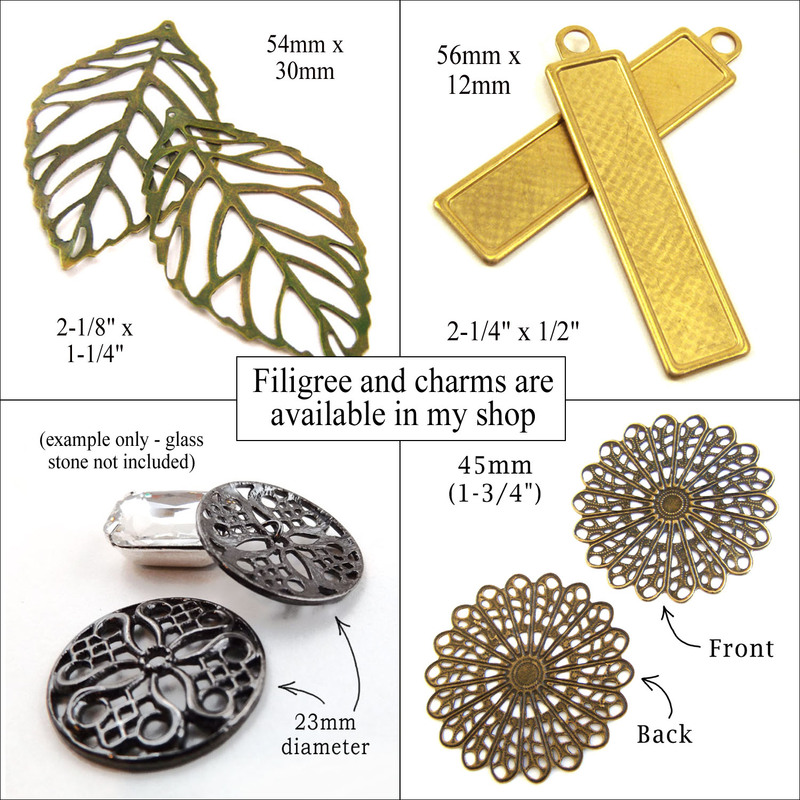 I just restocked a couple of these pretty filigree charms – and wanted to point out how useful they are for your DIY jewelry – and of course, for your Christmas gifts too! Add pretty jewels or charms, and turn them into pendants or earrings with your own special creative touch. Of course there are more charms in my shop – and if there’s one you are searching for and don’t see, just drop me a note! 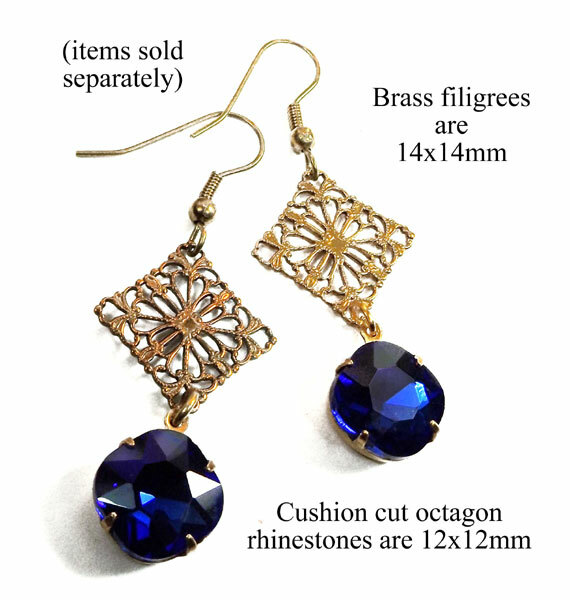 I couldn’t resist showing another example of how great earrings can be when they’re made with brass filigree and faceted rhinestones. It’s so useful when you find an “ornament” (charm, filigree, or other element) to pair with your glass jewels – it opens a whole new design dimension. Inexpensive, easy to create, and customizable – this is a terrific DIY earring design idea! Easy to customize with your favorite colors – affordable DIY earrings – and a great Christmas gift idea! 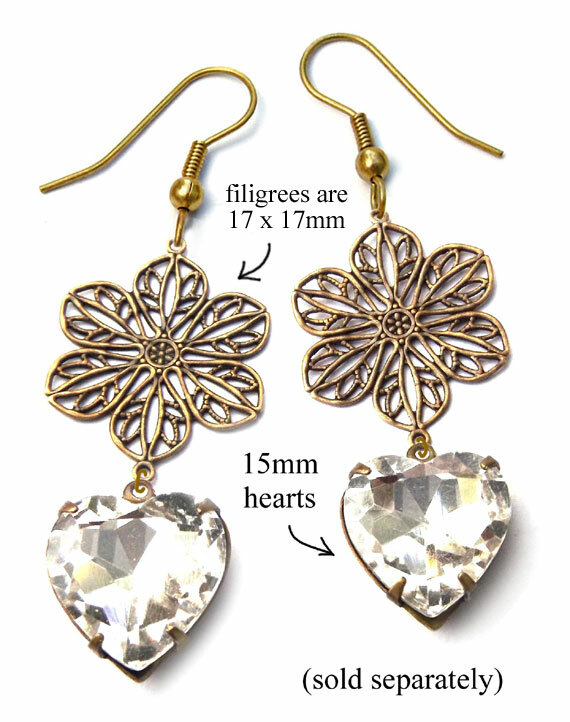 I know it’s not a new concept – brass filigree paired with glass jewels. I do think it’s a pretty great one though – tell me what you think! 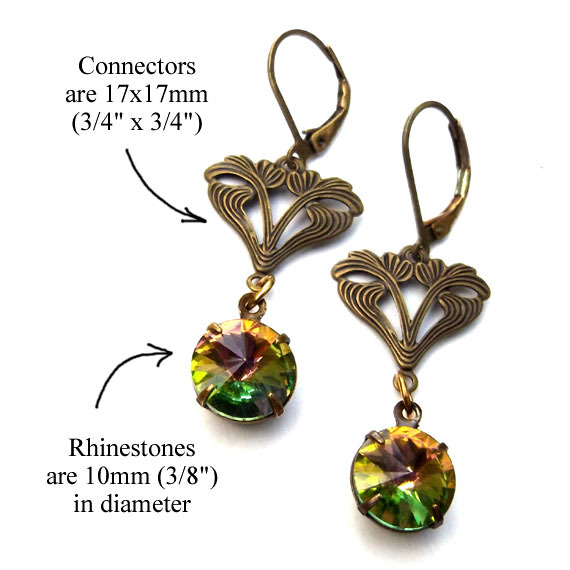 Take this basic concept – connectors paired with faceted rhinestones in prong settings. Then customize it – teardrop shapes, or your (customer’s) favorite color – you know the possibilities are endless! It doesn’t have to cost a lot, and it doesn’t have to be fussy and difficult. Just pretty and fun to wear! I thought these two components worked beautifully together! 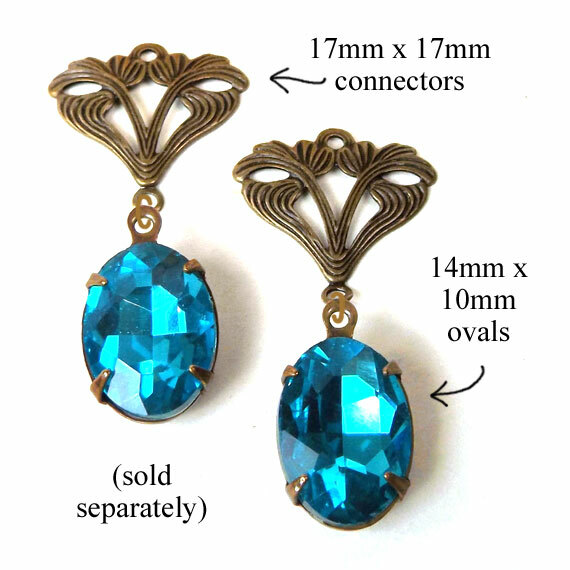 I’m loving the art-deco styled filigrees here, and with the two rings or loops it’s super easy to make fab earrings! It’s so cool that we can make pretty earrings with easy to use components – I’m lazy, I don’t want to work too hard! DIY jewelry design ideas – and a BOGO sale! DIY necklace design idea – rhinestones and gems! Spring 2019 – new BOGO sale! Aqua (aquamarine) glass gems – on sale! Clear glass beads and jewels – on sale! DIY bridal earrings – and save money ! Glass teardrop pendants – on sale! Do it yourself necklace design idea – welcome to 2019! DIY earring design idea, with flowers! DIY earring design idea – easy and pretty!